The “Cité du Design” (Centre International du Design) is a new institution for communication, research and education in design. The project is situated on the historical site of the National Arms Manufactory in St. Etienne, an important former industrial site of the area. It is the first step in an overall project of development of the city. The project involves the renovation of several historical buildings, as well as the integration of two gardens, the Place d’Armes (a large public esplanade), a new building (the Platine) and an observation tower (the Observatoire). The Observatoire is intended as an interaction between architecture, future programmes, public reception and opportunities of the site. 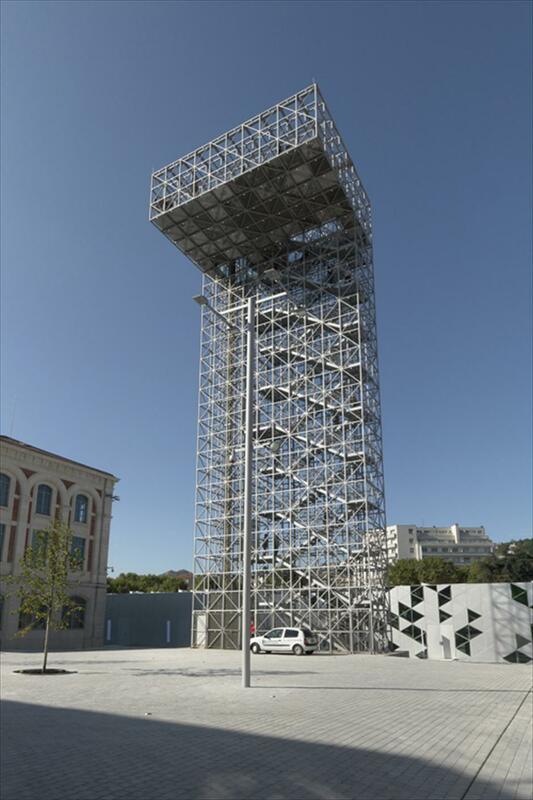 This observation tower offers a novel view of the town and its current development. 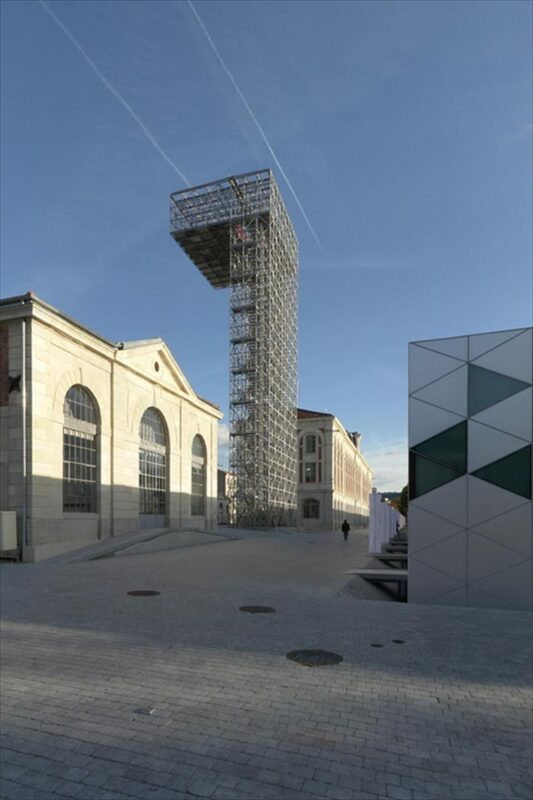 The 31-metre-high tower stands at the centre of the “Cité du Design” complex. Its structure is composed of 4088 metres of steel tubes linked by star-shaped joints. 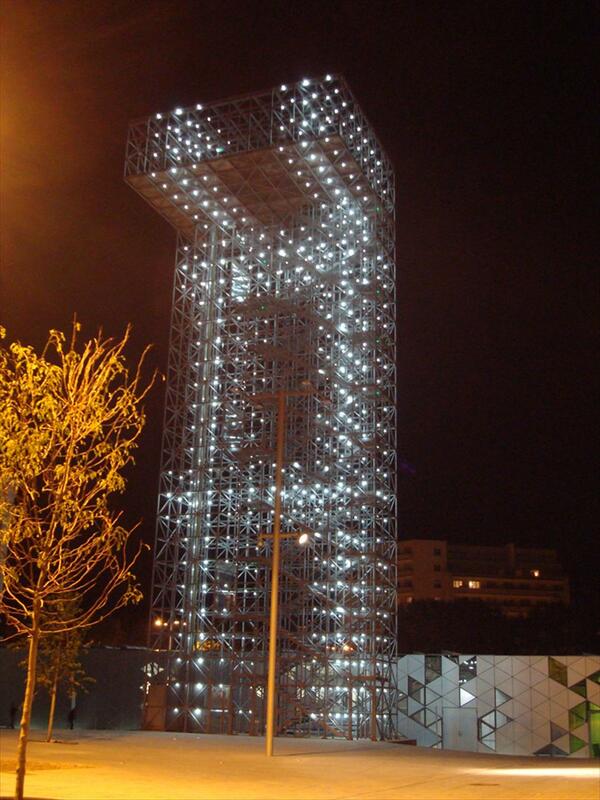 The platform at the top of the tower (100 m2) is reached by a lift and two staircases, and offers an all-round panorama of Saint-Etienne and the surrounding hills. The structural part of the tower represents only 10% of its volume, making it a lightweight construction that can be noticed very little at night, due also to its limited reflection of external light. 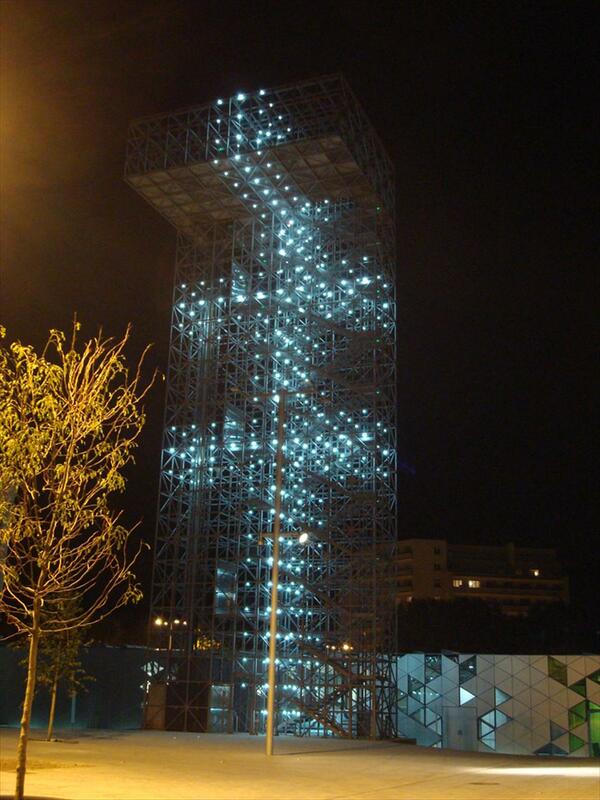 What instead makes the tower highly visible is the presence of a series of LED projectors aligned on its structure in a predetermined order. 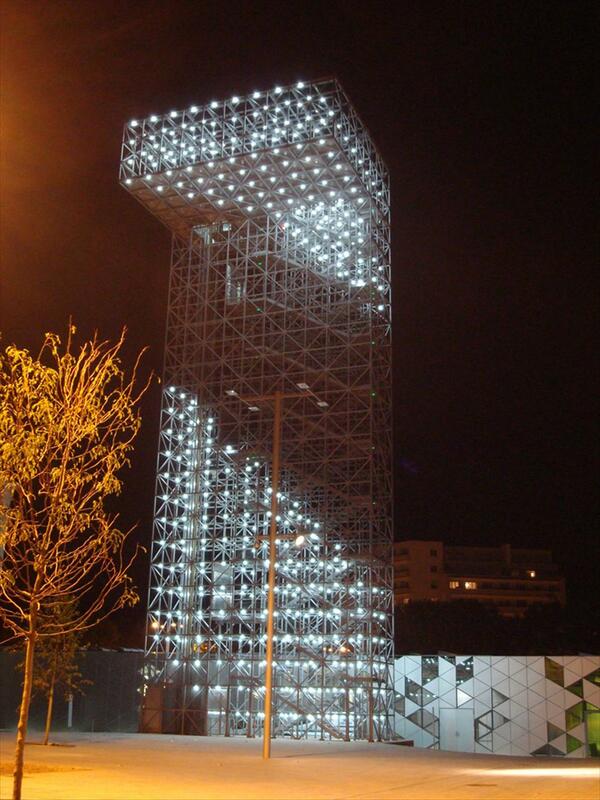 Architect Finn Geipel conceived the tower in fact as a gigantic three-dimensional image of variable form. This effect, similar to a drawing on a 3D software application, has been obtained by distributing 1082 PIXEL DROP projectors in a geometric pattern, not only on surfaces but also in parallel layers inside the structure itself. The projectors, the light intensities of which can be varied individually, are powered by Z60 power supplies/controllers, and are controlled by Madrix software. 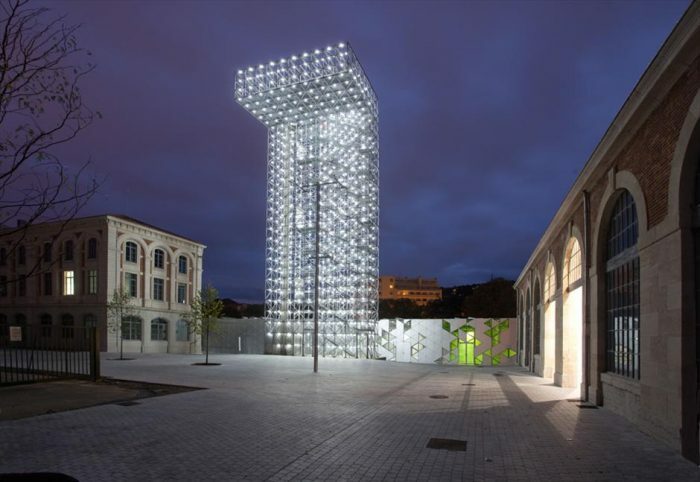 A virtually infinite series of moving images can be generated, and the tower can even be used as an enormous information display. 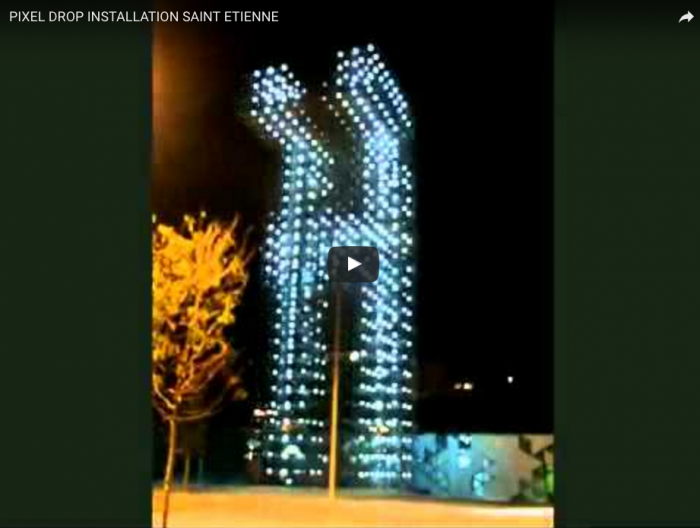 The tower has become a landmark for Saint-Etienne, and is very strongly identified with the “Cité du Design’”. 1082 x PIXEL DROP LED Matrix Systems (3x1W white P4 LEDs each, 6000°K).